Drainage product and access cover leader, Clark-Drain, has launched the CD 430 a new CE marked block slot channel made from 100% recycled polypropylene which is fully certified to Load Class B125 BS EN 1433 for block paving and Load Class C250 BS EN 1433 for concrete. Clark-Drain believes that the CD 430 is essential to domestic driveway applications because it offers a more robust and durable solution to the Class A15 block slot drainage channels often installed and answers the question over their suitability to manage the increasing loads of present-day cars and vans. Clark-Drain believes that there needs to be a wider debate about where A15 products are currently being used. Jeremy Nesbitt, Technical Manager at Clark-Drain comments, “One of the most common queries we get as a drainage product manufacturer is – “can I use an A15 loading on a driveway?” or (all too often) put another way – “I have an A15 product on my drive that’s broken, how come? The confusion is caused by interpretation of the A15 loading, i.e. 1.5 tonnes. To the untrained eye this equates to less than the weight of a car so the incorrect conclusion is drawn that an A15 product is suitable for their driveway when in actual fact the dynamic loads exerted through a single wheel can be significantly more. With a minimum Class B125 loading the CD 430 resolves this issue providing a strong, inexpensive alternative to other materials used in domestic and some commercial environments subjected to light vehicular traffic”. The CD 430 provides discreet drainage runs in driveways and other aesthetically sensitive areas – its visible water way area is just 10mm wide when installed – and because of its ‘loading’ versatility it can be used across a number of applications, including driveways (domestic or business), landscaping, threshold drainage, pedestrian precincts and other areas with light vehicular traffic. The system is inconspicuous as a result of an offset two part cover which enables up to 80mm block paving to be laid right up to the exposed slot. The rest of the system remains hidden underground. The CD 430 is also very easy to install with the ability to clip 1000mm length channels together for quick on-site assembly. 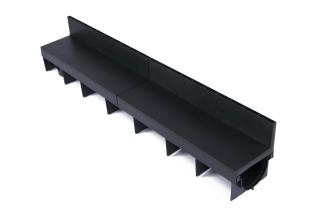 A ribbed channel wall design gives the CD 430 added strength and rigidity, and with a 75mm internal depth, the channel bore is very shallow, making it ideal for limited depth excavations. Accessories include closed end caps to fit either end of the channel. Jeremy continues, “The CD 430 offers greater flexibility for installers and specifiers looking for an unobtrusive channel drainage system for their hard landscaping projects by delivering appropriate loading performances which can stand the test of time”.